I’m writing a blog for Smart Girls Loop on healthier desserts for the holiday season, and I thought it would be the perfect excuse to make my own recipe for homemade brownies! 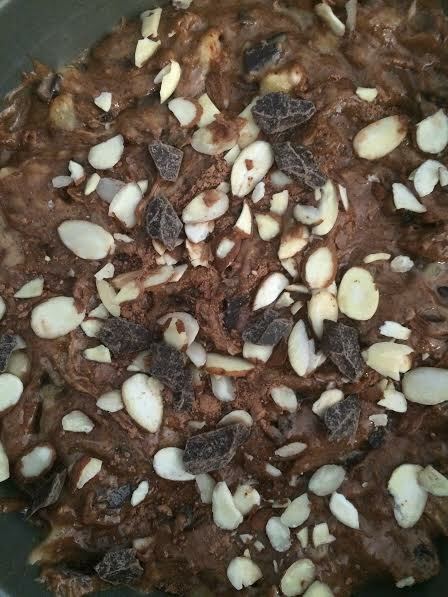 My inspiration came from FoodBabe’s Almond Butter Brownies, but I changed it up a little bit by adding a banana (instead of extra sugar), cacao powder, and sliced almonds for extra deliciousness. Serve when warm – forget about cooling them! My favorite part about these brownies are that they are gluten free (no flour!) and dairy-free. So, they are perfect for those picky eaters at all of your family gatherings. Now, I just need to find a way to make these brownies more festive for the holidays. Have any ideas? What do you like to bake this time of year? Try some crushed candy canes on top. My gluten free friends will love this!